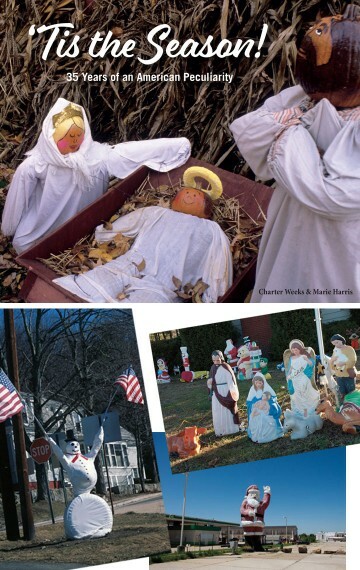 From the first time we hit the brakes and backed up to be sure we’d seen what we thought we’d seen—a Nativity diorama made entirely of pumpkin-headed figures—we were hooked. Charter photographed the scene and made it into a Christmas card. It was a great hit with family and friends and so began our tradition of documentary photo Christmas cards. Sometimes the pictures reflect, if inadvertently, the current mood of the country. 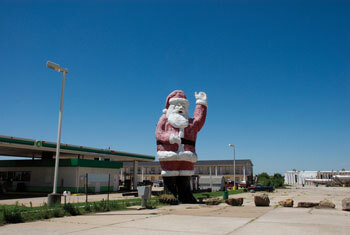 We spotted what we called “Santa: Too Big to Fail” in 2008, the year of the banking crisis. A storefront display we dubbed “Mrs Santa’s Stimulus Plan” happened to catch our eye the year the Feds created their own version of a stimulus plan. 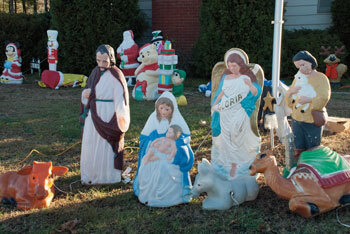 Once we began looking, it seemed that seasonal images, religious and secular, were everywhere. 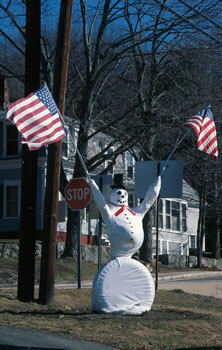 Our encounters have not been confined to New Hampshire or even New England, nor are they limited to winter. In our travels, we’ve spotted Santa and his paraphernalia on a balcony in Seattle, outside an Asheville brewery, at the edge of California’s high desert and in the middle of a North Dakota prairie in late spring. And we’ve seen Mary, Joseph and the Baby Jesus on a roof in Puerto Rico. It continues to be a wonderful project, surprising and fun. And it’s spawned an informal militia of digital-camera-wielding stalwarts who have taken it upon themselves to make sure that no odd Christmas display goes unrecorded. We get regular communications from these friends. In the words of Paul Valéry: A work of art should always teach us that we have not seen what we’ve been looking at. Aside from marking a season, these informal artworks that punctuate the landscape serve to focus the eye and tweak the mind, inviting us to “see” what we might otherwise overlook. We’ve collected them between covers for your enjoyment. 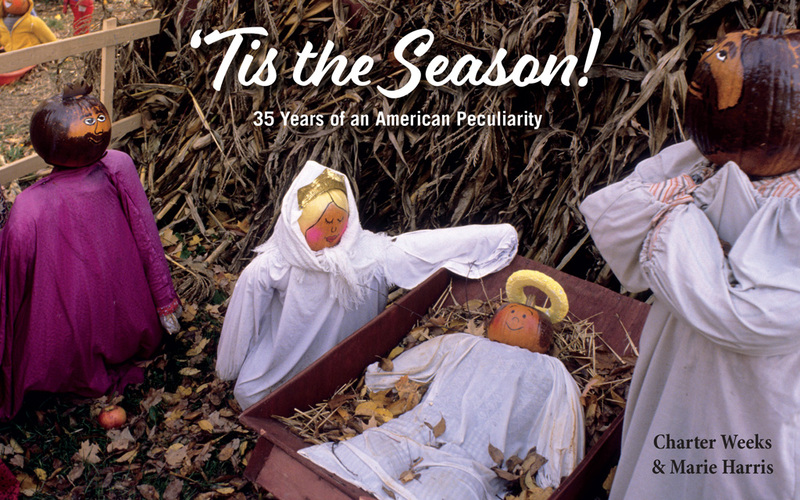 Click here to order your copy of ‘Tis the Season here!